pH – What Is It? How Does It Affect Weight Loss? You’ve found that a 12oz can of low-calorie diet cola sweetened with aspartame, one of the most acidic sweeteners you can find, contains only three calories. See Sweeteners: pH Food Values. “Great,” you say, “I can drink four cans a day and only consume twelve calories”. Hang on, that’s twenty-eight cans a week! “Yes, but I’m still only consuming eighty-four calories in a week”. True, but what about the pH value of that cola? As you have already learned, cola has a pH of 2.0 and it takes the pancreas over 70,000 times more effort to convert it to the optimum pH of 7.5. 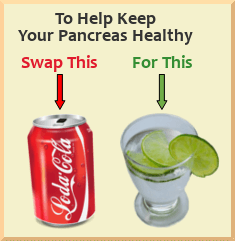 Imagine the strain on your pancreas having to do this four times a day, twenty-eight times a week! Also, this doesn’t take into account any other acidic food or drink you may consume during the day. How long can your pancreas keep this up before it reaches a point where it can no longer neutralize the acidity of your bodily fluids? It’s food for thought (no pun intended). When this point is reached, as it inevitably will, and the pancreas can no longer neutralize the excess acid, the body will create fat in an attempt to store and neutralize the acid and prevent a build up of toxins, caused by excessive acid, from entering the blood stream and causing all kinds of complications. Now you can understand why, even though you are on a low calorie diet, you are not losing weight, maybe even gaining some, because the weight lost by reducing your calorie intake is counteracted by the fat being produced by the body to neutralize excess acid in your body fluids. “I’ve been on a low-calorie diet for four weeks now and nothing’s happened, some weeks I even gain weight! It’s just a waste of time”. This needn’t be so! To reverse this trend you need to convert your acidic bodily fluids so they become alkaline with the optimum pH of 7.3 to 7.5. How many people, on deciding to diet for weight loss, carefully choose a diet with the correct balance of protein, carbohydrates, fat and calories but don’t know, or can’t be bothered, to check the pH of the foods that will constitute their diet. As already explained, your body has a natural pH of 7.3 to 7.5. Get this right and, although not easy, you will start winning the war on weight. You already know that a can of cola is highly acidic with a pH of 2.0 and drinking four cans a day makes your pancreas work overtime to convert the acid to optimum pH and also doesn’t help improve your health, just the reverse. Water is a far healthier option! In the UK and the USA, tap water, due to stringent purity tests, is often purer and healthier than many of the commercially produced spring, mineral and bottled drinking water, which don’t have to undergo such stringent tests. It also contains many beneficial minerals and has a pH of 7.0, which is neutral. See post: Water – Which Is Best? Apart from allowing your pancreas to operate normally, water helps flush toxins from your body through your normal bodily functions, ideal for detoxing! Steer clear of all commercially produced flavored bottled water, particularly carbonated, as they are mainly sweetened with artificial sweeteners and flavoring, which are highly acidic. Distilled water, also known as dead water, should be avoided as it contains no mineral content and is also acidic. “But I don’t like water, it’s tasteless.” OK, why not make your own flavored water. “But I thought you advised steering clear of flavored water?” I did, but that was commercially produced water. “Well, how do I make it?” It’s quite simple. Fill suitable containers with tap water, you can boil it if you prefer. This won’t remove any pathogens that may exist in the water but will render them harmless. If you decide to boil the water allow it to cool then squeeze the juice of a lemon or lime, or both if you fancy lemon and lime flavor, into the water giving you a healthy sugar free natural flavored water. “OK, but won’t citrus fruits being acidic lower the pH of the water?” No, believe it or not. Although citrus fruits are acidic, once eaten they have an alkalizing effect on the body, with lemons and limes being among the higher rated for alkalinity, but most citrus fruits have some degree of alkalinity when eaten. Don’t just stop with cola and sodas, with a bit of research, there are many acidic food and drink that can be replaced with healthier alkaline ones. The content of this post is for information only and not meant to give advice. If you feel you may have any health problems related to pH it is always advisable to seek professional advice from a medical practitioner.